Celebrating two decades of their own label, Viktor and Rolf made a return to couture after thirteen years of absence with a cerebral, beautiful, collection of garments, all in black, all in the same fabric, with reference to the Japanese art of zen in theme. They showed some gloriously wearable draping and styling along with the interesting but ‘ooh, I’m not sure anyone would be able to wear that’ which is where cerebral does sometimes take you in flights of fantasy. I find the experimentation so refreshing to both eye and brain – like a little jolt of electricity to wake me up. This intellectual approach to fashion is a million miles away from the commercial elitism of the standard haute couture offer and relevant to all of us who love fashion and style – fat, ageing, disabled, whomever. It makes me yearn for the energy and health to pursue my original ideas for Plus Black – developing a range of clothes, in black, for women of middle age undergoing significant life change. 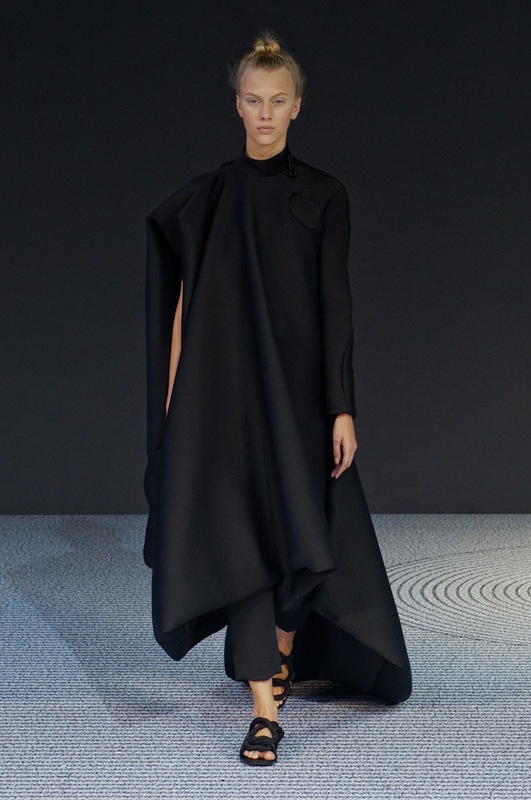 All around me, I see so much to inspire me in this not least in this collection by Viktor and Rolf. Rumour has it that a collector has already snapped it up in its’ entirety – no surprise to me. I’ve added the Viktor & Rolf Youtube video below (c.13mins.). Do let me know if you like it as much as I do.